San Diego Clinical Psychologist shares common questions to joining group therapy. “People in group therapy improve not only from the interventions of the therapist, but also from observing others in the group. 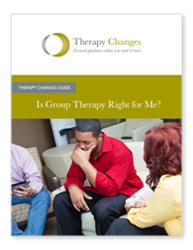 Today, Therapy Changes released a new guide titled, “Is Group Therapy Right for Me?” The guide outlines common questions an individual may have to joining group therapy or counseling, in addition to common types of groups an individual can attend. “People in group therapy improve not only from the interventions of the therapist, but also from observing others in the group and receiving feedback from group members,” says Rochelle Perper, Ph.D. and founder of Therapy Changes. The guide also shares overall benefits to group therapy and three types of sessions offered by Therapy Changes. To download the free guide, visit the Therapy Changes website.